There are around 100 copies of this book worldwide, the library had five. 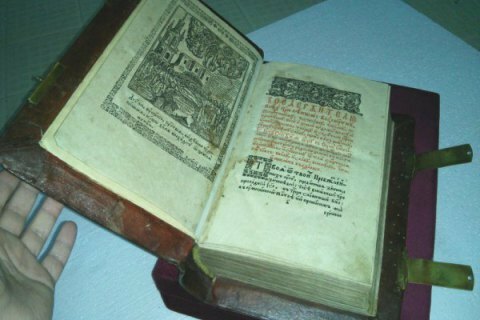 The National Volodymyr Vernadskyy Library has admitted the loss of the old book Apostolos, printed by Ivan Fedorov in Lviv in 1574. "On 10 May, Kyiv's Shevchenkivskyy district police department received a report that a book printed in 1574 from the early printed books department in Volodymyrska St.", the official website of the metropolitan police reported. The library's spokesperson, Lidiya Poperechna, confirmed the disappearance of the Apostolos. She said the library had five of around 100 copies of the book that have survived worldwide. Police have conducted a primary investigation in situ and questioned the library staff. Criminal proceedings were opened into the theft. Earlier, one of the copies of the Apostolos was discovered in the residence of former President Viktor Yanukovych in Mezhyhirya after the latter hastily fled the country. The authenticity of the book was confirmed by the certificate signed by a leading Ukrainian expert in the field L. Khaukha, which was found close to the book. Apart from the Apostolos, some other 16th century books were found in Yanukovych's residence, all with authenticity certificates.